“Should I get her to eat more?” A definite NO is the answer to this question. We’re born with a very clear idea of how much to eat, so parents have to trust their babies and not interfere with their feeding role. Deciding HOW MUCH to eat. Infants can’t talk at this age, but they will give you very clear signs when they are hungry or full. 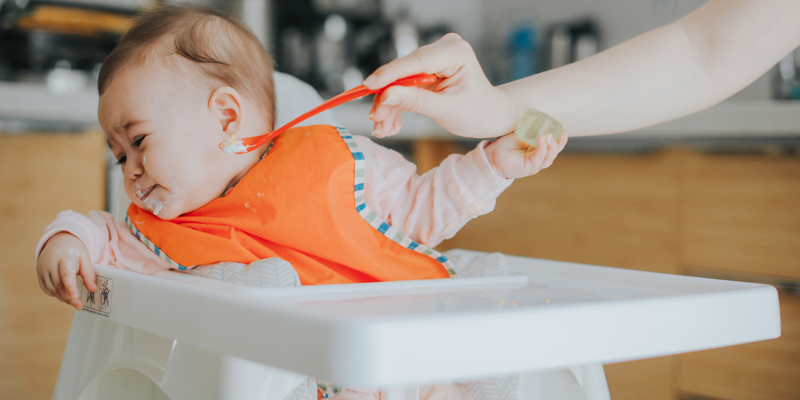 Your bubs role of deciding whether to eat and how much to eat is the same for when they become a toddler and will continue right through into their teenage years. 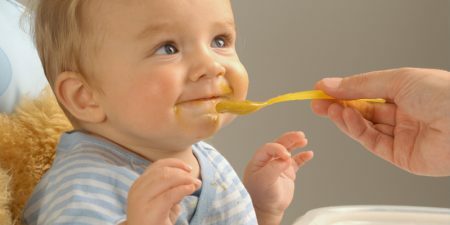 Before babies start solid food they are in charge of WHEN they’re fed. When baby starts solid food they are moving (with your help) to having structured meals and eating family food. WHEN and WHERE babies eat starts becoming up to you. You are always in charge of WHAT bubs are fed, either breast or formula milk and then which solids babies are served. Trust their tummies, they know how much to eat, they know it much better than you do. What happens when you try to control how much they eat? Children whose parents have tried to control the amount they eat, are more likely to be overweight. 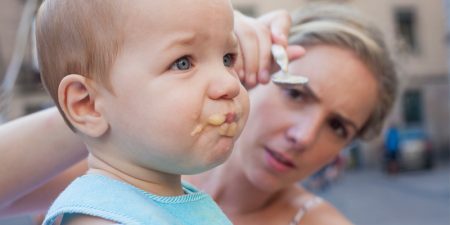 Problems with fussy eating as infants move into the toddler age. Much greater stress at meals (for you and them). Children who lose the ability to stop eating when they are satisfied. Children more likely to be overweight. Children who eat less variety of food. If allowed to own their eating, they’ll grow to love a variety of foods. 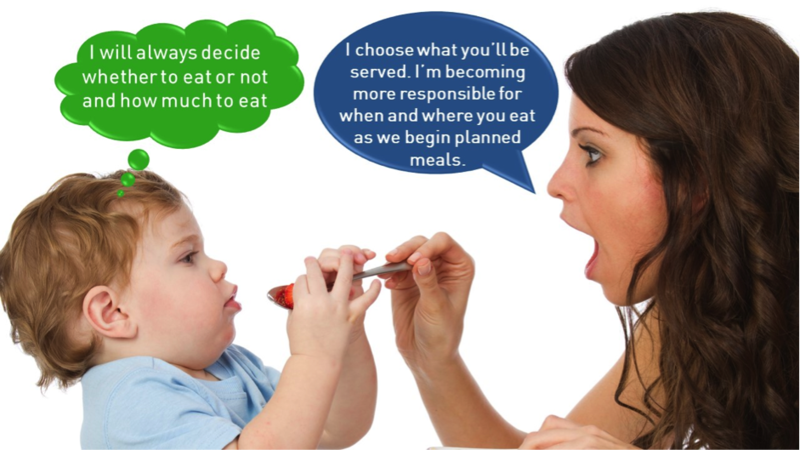 If an infant starts choosing what they eat, there will be less variety and you’ll be feeding them more unhealthy foods. Bub is still and always will be, responsible for how much and whether to eat the foods offered by the parent. Don’t follow them with the spoon. Stop the feeding of the meal when you can tell they are done eating. Keep calm! If they don’t eat and you feel they should, then be comforted by the knowledge that they are not eating because they don’t want to or need to. Trust their tummies, they know how much to eat, they know it much better than you!